Ice-Nine Comes to the Desert. 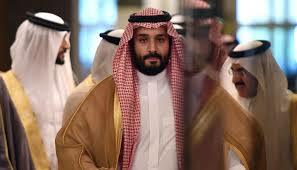 Saudi Political Targets Scramble for Gold. In my most recent book, The Road to Ruin, I describe a phenomenon called “ice-nine.” The idea is that in the next financial panic, regulatory authorities will not be able to print money or lower rates enough to stop the panic because they failed to normalize rates or balance sheets after the last recession. Liquidity will drain out of money market funds and the government will have to suspend redemptions to prevent a collapse. Investors will then turn to banks for liquidity and the only response will be to close banks. Then investors will dump stocks, and the stock exchanges will close, and so on. One by one, the entire system will be “locked down” to stop a liquidity crisis that’s bigger than the central banks’ ability to liquefy. I got the idea for ice-nine from another book, Cat’s Cradle, by Kurt Vonnegut. In that book, a doomsday machine in the form of a water molecule called ice-nine is unleashed. The molecule is frozen at room temperature and turns water into more ice-nine when it comes into contact. Eventually all of the water on earth turns to ice-nine and life on earth dies in a frozen wasteland. That seemed like a good metaphor for how the financial system will be locked down little by little until the whole system is frozen. Some readers objected that this could never happen. My answer is that it happens all the time. In 2013, the banks in Cyprus were frozen. In 2015, the same thing happened in Greece. In 2017, the Spanish government shut down banks in Catalonia in response to an independence movement. Banks in Puerto Rico were shut when the power went out after Hurricane Maria. Every bank in America was closed shut in March 1933. As the article shows,bank accounts of political targets are being frozen today in Saudi Arabia. Whether the reason is financial panic, natural disaster, or political targeting, the result is the same. Freezing bank accounts is the first resort of governments trying to maintain control. When skeptics say, “It can’t happen here” I point out that it did happen here in 1933, and it’s happening again all over the world.